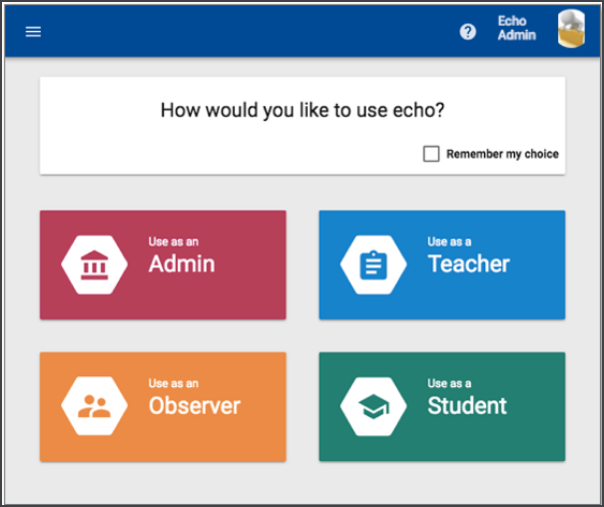 Signing in to Echo is simple, whether you are a Teacher, Student, or Parent. NOTE: Each school has its own unique URL. Ask your school for the web address to Echo. You will also need a username and password that is also provided by the school. Open your school's Echo website. Echo has for parts. Depending on your role, you may see buttons that take you to each part. Typically, students and parents will be directed to the appropriate place automatically. If prompted, select the desired App (Student, Teacher, Observer, or Admin). If you don't have your schools URL, contact your school leader and/or the Echo Administrator. You have access to sensitive student information, keep your sign-in details secure. Contact your schools Echo Administrator if you forget your sign-in details. Echo is constantly being improved based on the feedback from users and we strive to keep our documentation up to date. If this document does not match what you are seeing in Echo, please let us know.